PPSH 41 Russian Machine Gun modelled in Blender 2.78 Cycles. The model is a low poly game ready model which has been modelled from the reference pictures of PPSH 41. Other formats (FBX, 3Ds, OBJ) of the model exported from Blender 2.78 but they have not been tested. In case of any problem in any of the other formats, please let me know and hence, problem can be solved at most within 24 hours. 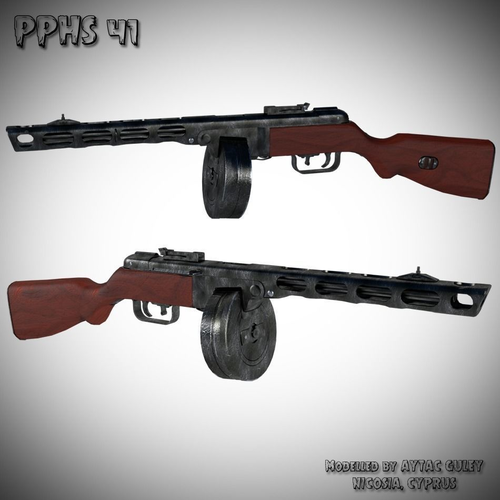 The PPSh-41 (pistolet-pulemyot Shpagina; Russian: Пистолет-пулемёт Шпагина; Shpagin machine pistol); is a Soviet submachine gun designed by Georgi Shpagin as a cheap, reliable, and simplified alternative to the PPD-40. Common nicknames are pe-pe-sha from its three-letter prefix and papasha, meaning daddy. The PPSh is a magazine-fed selective fire submachine gun using an open-bolt, blowback action. Made largely of stamped steel, it can be loaded with either a box or drum magazine, and fires the 7.62×25mm Tokarev pistol round. The PPSh saw extensive combat use during World War II and the Korean War. It was one of the major infantry weapons of the Soviet Armed Forces during World War II.